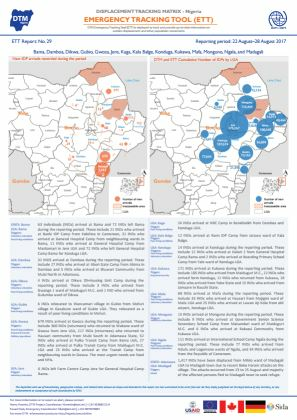 This is a compilation of all site profiles in Borno identified in Round 18. This is a compilation of all site profiles in Taraba identified in Round 18. 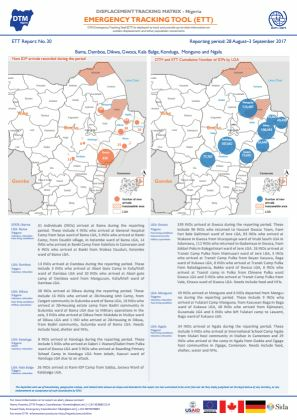 This is a compilation of all site profiles in Yobe identified during Round 18. 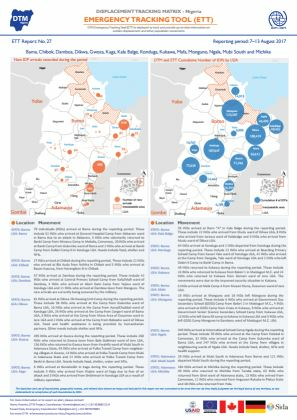 DTM Emergency Tracking Tool (ETT) is deployed to track and provide up-to-date information on sudden displacement and other population movements in: Bama, Damboa, Dikwa, Gwoza, Kala Balge, Konduga, Monguno and Ngala. 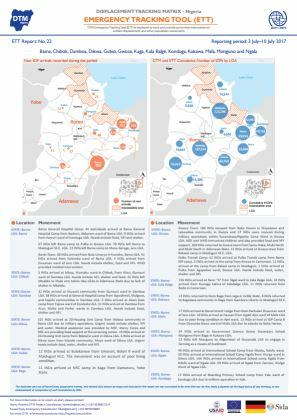 DTM Emergency Tracking Tool (ETT) was deployed to track and provide up to date information on sudden displacement and population movements in: Bama, Damboa, Dikwa, Gubio, Gwoza, Jere, Kaga, Kala Balge, Konduga, Kukawa, Mafa, Monguno, Ngala, and Madagali. From 14 to 22 August 2017, arrivals were registered in the following Local Government Areas: Bama (20), Damboa (23), Dikwa (22), Gubio (20), Gwoza (738), Kaga (28), Konduga (13), Kukawa (48), Mafa (63), Monguno (42), Ngala (392), Madagali (1,511), and Shelleng (159). 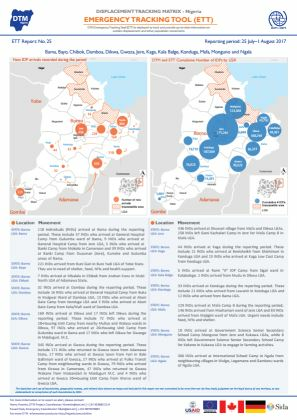 The DTM emergency tracking tool was deployed to track and provide up-to-date information on sudden displacement and other population movements in: Bama, Chibok, Damboa, Dikwa, Gwoza, Kaga, Kala Balge, Konduga, Kukawa, Mafa, Monguno Mubi South and Michika. 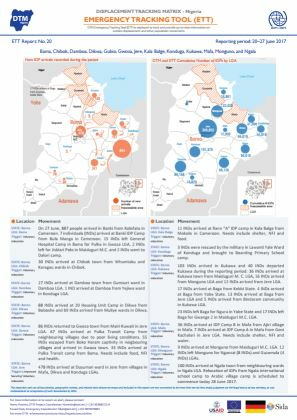 The DTM emergency tracking tool was deployed to track and provide up-to-date information on sudden displacement and other population movements in: Bama, Chibok, Damboa, Dikwa, Gwoza, Kaga, Kala Balge, Konduga, Kukawa, Mafa, Monguno and Ngala. 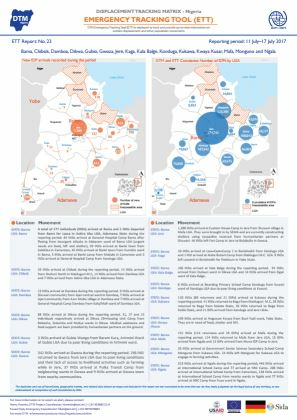 The DTM emergency tracking tool was deployed to track and provide up-to-date information on sudden displacement and other population movements in: Bama, Bayo, Chibok, Damboa,Dikwa, Gwoza, Jere, Kaga, Kala Balge, Konduga, Mafa, Monguno and Ngala. 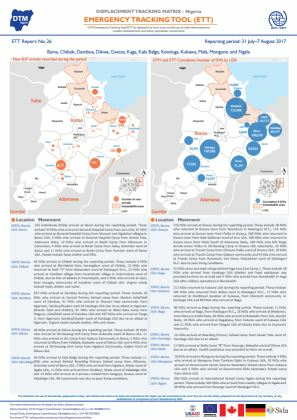 This DTM Emergency Tracking Tool (ETT) has been deployed to track and provide up-to-date information on sudden displacement and other population movements in Bama, Chibok, Damboa, Dikwa, Gwoza, Jere, Kaga, Kala Balge, Konduga, Mafa, Monguno and Ngala. 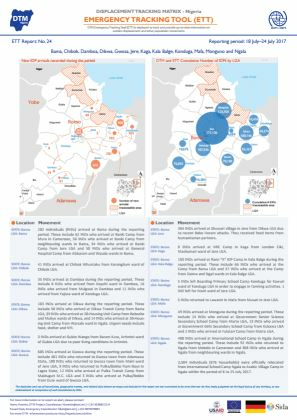 This DTM Emergency Tracking Tool (ETT) has been deployed to track and provide up-to-date information on sudden displacement and other population movements in Bama, Chibok, Damboa, Dikwa, Gubio, Gwoza, Jere, Kaga, Kala Balge, Konduga, Kukawa, Kwaya Kusar, Mafa, Monguno and Ngala. This report of the Round XVII Displacement Tracking Matrix (DTM) assessment by the International Organization for Migration (IOM) aims to improve understanding of the scope of displacement and the needs of affected populations in conflict-affected states of northeast Nigeria. 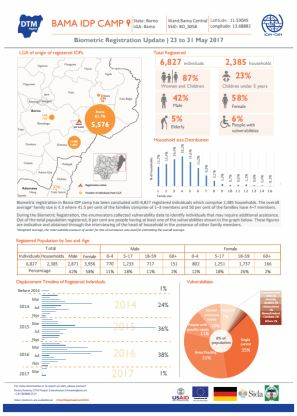 This DTM Emergency Tracking Tool (ETT) has been deployed to track and provide up-to-date information on sudden displacement and other population movements in Bama, Chibok, Damboa, Dikwa, Gubio, Gwoza, Kaga, Kala Balge, Konduga, Kukawa, Mafa, Monguno and Ngala. 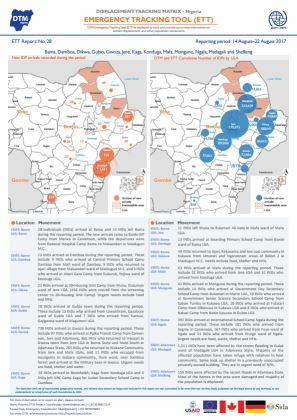 DTM Emergency Tracking Tool (ETT) is deployed to track and provide up-to-date information on sudden displacement and other population movements in: Bama, Chibok, Damboa, Dikwa, Gubio, Gwoza, Jere, Kaga, Kala balge, Konduga, Monguno, and Ngala. 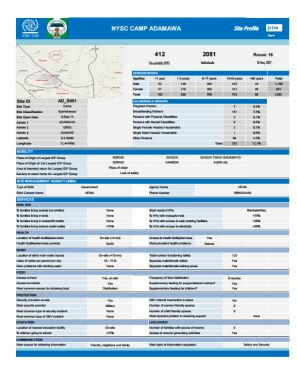 This Emergency Tracking Tool (ETT) report provides a snapshot on Bama, Chibok, Damboa, Dikwa, Gubio, Gwoza, Jere, Kala Balge, Konduga, Kukawa, Mafa, Monguno, and Ngala. During the reporting period, DTM recorded the movement of 894 individuals in Bama, 478 in Jere and 241 in Gwoza. 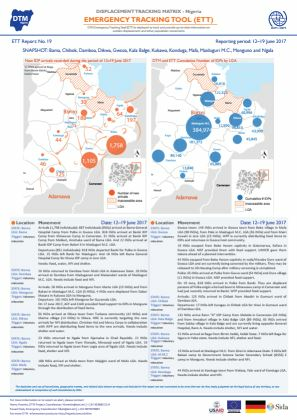 DTM Emergency Tracking Tool (ETT) was deployed in Nigeria to track and provide up-to-date information on sudden displacement and other population movements. During the reporting period 6,827 individuals (2,385 households) were identified. Of these, 87% were women and children and 23% were children under 5 years old. 42% of the population was male and 58% was female. During the reporting period 15,074 individuals (6,289 households). Of these 84% were women and children and 24% were children under 5 years old. 41% of the population was male and 59% was female. 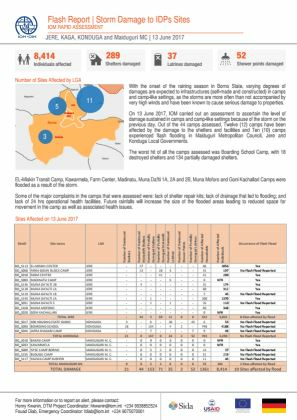 The worst hit of all the camps assessed was Boarding School Camp, with 18 destroyed shelters and 134 partially damaged shelters. 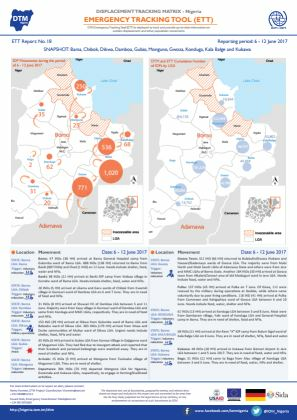 EL-Miskin Transit Camp, Kawarmela, Farm Center, Madinatu, Muna Da’lti 1A, 2A and 2B, Muna Moforo and Goni Kachallari Camps were flooded as a result of the storm. 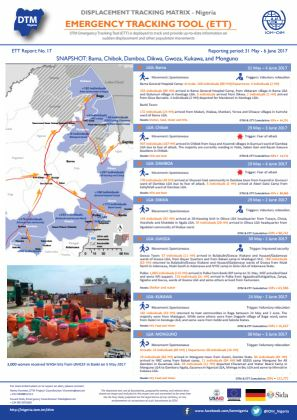 This Emergency Tracking Tool (ETT) report provides a snapshot on Bama, Chibok, Dikwa, Damboa, Gubio, Monguno, Gwoza, Konduga, Kala Balge and Kukawa. During the reporting period, DTM recorded the movement of 1,020 individuals in Bama, 536 in Dikwa and 771 in Gwoza. 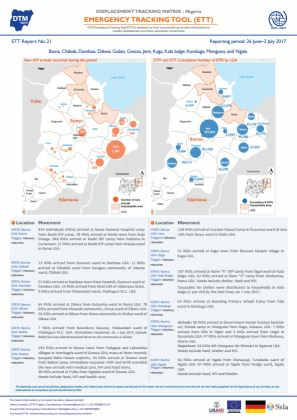 DTM Emergency Tracking Tool (ETT) was deployed to track and provide up to date information on sudden displacement and population movements in: Bama, Chibok, Damboa, Dikwa, Gwoza, Kukawa, and Monguno. 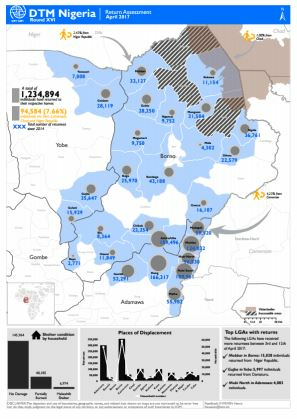 Total number of identified IDPs increased by 51,588 (3%) individuals from last DTM round. 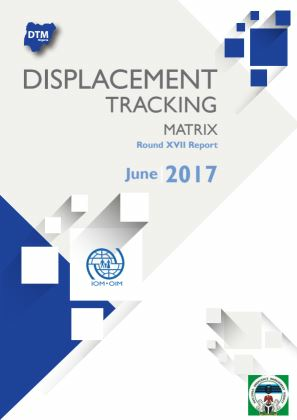 The number of identified returnees increased by 83,467 (7%) individuals from the last DTM round. 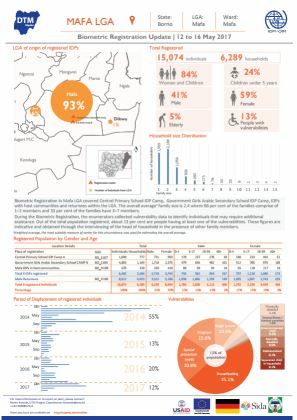 A survey of unmet needs showed that food remains the predominant need in majority (70%) of IDP sites. This document contains all Adamawa site profiles for round 16.